The two players, from the same club, are both defenders and manager Dave Challinor was looking to tie up the loose ends. Tomorrow’s fourth qualifying round tie has a lot riding on it, with a place in the first round proper at stake, the draw for which takes place on BBC2 on Monday night. Wrexham are among the promotion pacesetters in Vanarama National League One, currently occupying fifth place in the table. The Welsh side have a noted FA Cup pedigree. Whenever the television companies revisit FA Cup shocks, there is invariably a reply of the Red Dragons beating Arsenal in the third round in 1992 thanks to goals by Mickey Thomas and Steve Watkin. There should be a big crowd at Mill Farm as Dean Keates’ Wrexham boast a sizeable following. Challinor said: “It should make for a great atmosphere and a great occasion and the game is coming at a good time for us. “Wrexham are going well in the league and their fans will travel in numbers to watch a team that os going well in the league. 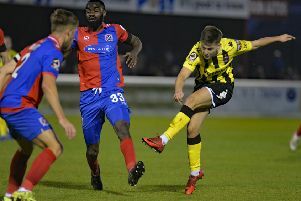 The Coasters will be without Lewis Montrose, who was sent off for the second match in a row when shown a red card in the 2-1 defeat at Sutton United; in his previous appearance for the club the midfielder got his marching orders in the 2-1 victory at Leyton Orient. Despite that poor disciplinary record, Challinor said there was no need to give the player a dressing-down. He said: “Lewis apologised to the lads after the Sutton game and he has been sent off there after committing only three fouls. “When he has fouled for the third time, the crowd starts baying for him to be sent off and that’s what happened. “It was the same in the Leyton Orient game, there was nothing at all malicious, they were just mistimed tackles. “If we are not careful, then we are going to stop people tackling. “There would be a problem with me if he wasn’t trying to make tackles. “It is not a question of Lewis losing his head or anything like that. It is disappointing to lose him; he wants to lead and to do well for us and he is very important to our team,” Challinor added.